Advanced Refrigerant Technologies, LLC (A.R.T.) offers cost effective solutions to the refrigerant management challenges. As government regulations and environmental concerns have changed the way refrigerants are handled and used, Advanced Refrigerant Technologies has responded with services designed to minimize downtime and labor costs and to ensure continued operation of your equipment. Advanced Refrigerant Technologies provides a full range of services including supplying refrigerants, analytical testing and reclamation of used refrigerants. All work is performed in strict compliance with EPA regulations and all local, state and federal laws. 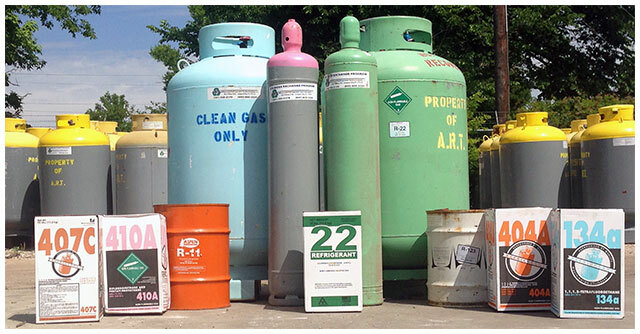 Advanced Refrigerant Technologies, LLC has been involved in the “recovery, recycling, and reclamation of refrigerants since the enactment of the Clean Air Act. Our goal has been to meet the needs and to preserve the assets of the industry’s refrigerants. We are proud to be leaders in the development and use of specialized equipment for recovery and reclamation on all types or refrigerants. We have an extensive inventory of equipment and both EPA and TWIC certified, trained, and experienced technicians to handle any job. Our facility is capable of reclaiming thousands of pounds of refrigerants on a daily basis. We understand that our customers rely on us to keep valuable systems operating. For that reason, we have made quality service, rapid delivery and competitive pricing our trademarks. Let Advanced Refrigerant Technologies develop a refrigerant management program that is right for you.